Our Thermo Scientific LTQ-Orbitrap Mass Spectrometer is designed for the identification of proteins and specific post-translational modifications from complex peptide mixtures. It is particularly useful for the identification of proteins from pull-down assays and TAP-tagging studies. 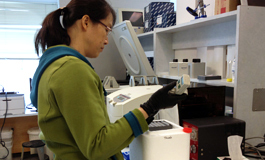 We can also use this systems to perform detailed proteome profiling of organisms. Watch and learn what CAGEF proteomics can do for you!